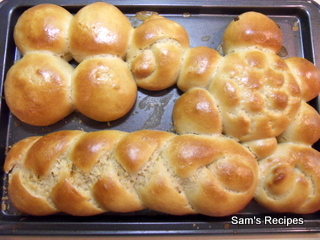 Baking bread is one of the simplest tasks in home baking. The recipe is easy and fool proof. 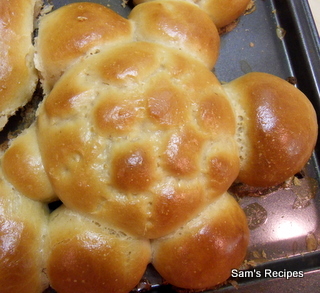 The product tastes great and the best part is that the bread can be baked into any shape. Just let your imagination run wild. Prove the yeast by mixing yeast with sugar and water and letting it stand for 5 mins. When the yeast starts frothing slightly, add the salt and the flour. Slowly add milk till the dough starts coming together. Flour the chopping board surface and knead the the dough with the ball of your hand till it is smooth. Keep aside a few tablespoons of milk. Let the dough rest in a bowl covered with cling film till it is doubled in size. This will take about 2 hours. Make a cut in the shape of a cross on the dough. This will help it rise better. Punch the dough and knead it again. Dust the surface with flour if required. Roll the dough into a rough rectangle and make 12 cuts. Knead each piece like you are tucking in the sides. This will give a nice smooth ball. Place the dough balls close to each other on a greased baking tray and let them rest for about 1 hour till they are doubled in size. 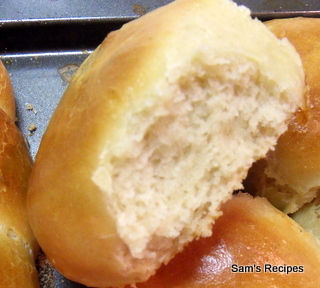 Wash the dough balls with half the leftover milk. Bake in a pre-heated oven for 30 mins at 180C for 30 mins. Wash the dough balls again with the leftover milk and turn the tray around for even baking. The double wash will give a better gloss and colour to the bread. Let cool completely on a wire rack before serving.